Inside Storey: We're Almost There! 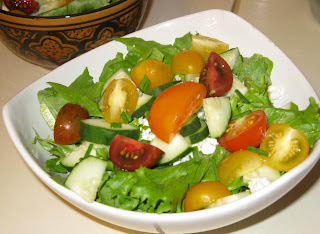 I made my first true garden salad of the year with fresh-picked ingredients from my garden! — well . . . some of them, anyway. (the red one), and the chives on this salad all came from my backyard. This past Tuesday evening I was sitting on my deck, enjoying the beautiful weather and reading up on some of the vegetables I have growing in my garden. Being a newbie gardener, I decided it would be a good idea to consult with The Vegetable Gardener's Bible by Ed Smith. 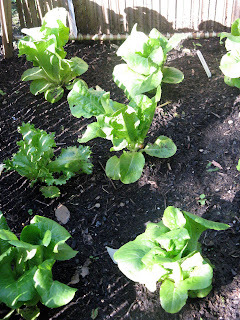 One of my garden concerns was that many of the leafy greens on my not-quite-yet heads of lettuce (Buttercrunch and green leaf) were flopping to the ground. I wondered if something was wrong — they weren't heads yet, but it didn't seem right to let the leaves flop to the ground like that. protect it from the bunnies and woodchucks in the neighborhood. Lettuce goes from seeds to salad in about a month in many regions and only a little longer in others. Once it has grown to the size you prefer, there are three ways you can harvest the bounty. Harvest as microgreens. 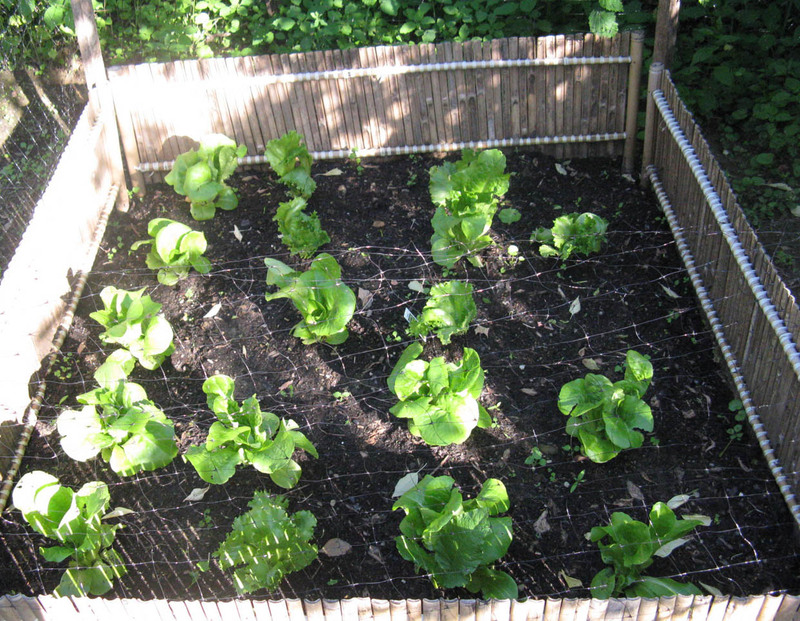 Many lettuces, particularly leaf lettuces, are grown to be harvested as microgreens for salads when the leaves are only 2 to 3 inches (5 to 8 cm) long. Cut the whole plant just above the soil. Gather outer leaves. With all except iceberg types, start gathering the outer leaves as soon as they’re big enough for the salad bowl. The harvest is over when a central stem starts to form. This signals that the plant is getting ready to bolt, and the leaves will start to have a bitter taste. Cut-and-come-again. Cut leaf lettuces about an inch (2.5 cm) above the soil as soon as most of the leaves are salad-sized. The plant will continue to grow and provide a second and sometimes a third harvest. Harvest the entire plant. This method can be used for any type of lettuce. 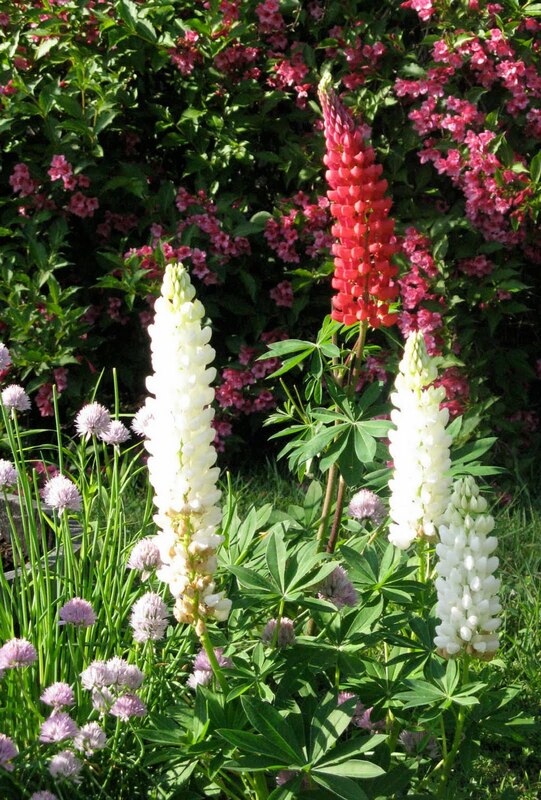 Wait until the plant is mature, but still young and tender, and harvest the whole thing. Based on Ed's advice I decided to harvest (that night) per the "Gather outer leaves" method, and I had enough greens for three salads — one for me, one for my husband, and one for lunch the next day! 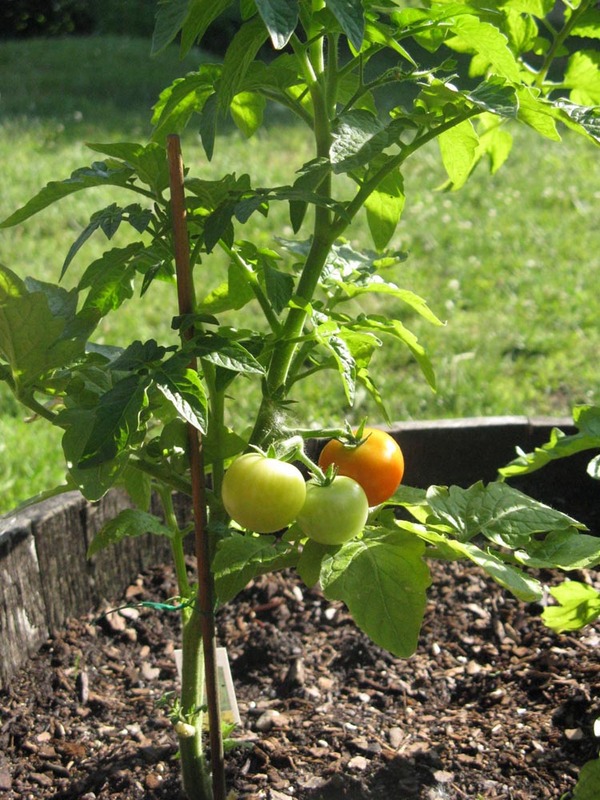 Additionally, that same evening, I had my first ripe cherry tomato (from a 10"-high plant purchased at the farmers’ market 4 weeks ago). I garnished and added flavor to the salads with a few fresh chives. 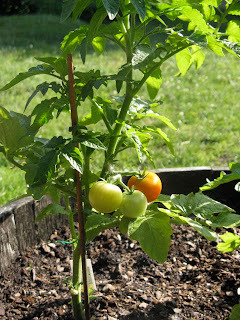 I am hoping that in a few weeks I will have more of my own garden veggies to add. The peas are almost ready for picking (and taste great on salad), and a few more cherry tomatoes are ripening. The beans have 2 to 3 more weeks before I can harvest any, and the cucumbers still have a ways to go — I'm thinking they might be ready in late July. However, I like cukes too much to go without them in my salads, so I will continue with store-bought until either I or the farmers’ market vendors are able to harvest them. and should be ripe and ready to pick any day. Have you been able to harvest and eat any of your crops yet? We would love to hear about what you have harvested and made with your harvest. I've harvested many herbs, including lovage, parsley, garlic chives, etc., plus arugula, which were volunteers from last year's volunteers. I never have to plant parsley or arugula, as they self-sow. So far, this year's garden is looking good! I'm so glad you posted here instead of on Facebook! My chives are the only plant that self-sowed, but too much! I had to dig up about 25 plants — I gave a bunch away. Although it did not self-sow, my sage renewed itself. It is now practically a bush of sage. I'm curious what you cook with lovage. I just looked it up, but previously I had never heard of it. It tastes like celery leaves, so I use it mostly in salads and soups. I have put the leaves in a chicken cavity, along with other herbs. 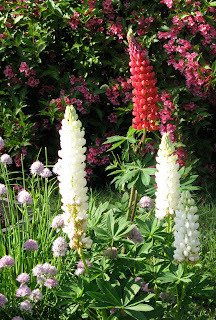 It's very easy to grow and gets quite tall.